During third grade, children are really flexing their “idea” muscles and learning to express those ideas in more sophisticated ways. Sentences are getting longer and more complex. Kids are learning to use a dictionary to correct their own spelling. Grammar improves; for example, you'll see appropriate punctuation, contractions, and correct subject-verb agreement. Third graders can write an essay with a simple thesis statement, examples and supporting details, and a thoughtful concluding sentence. They are building skills in the writing process — research, planning, organizing, revising, and editing (with help from teachers and peers). 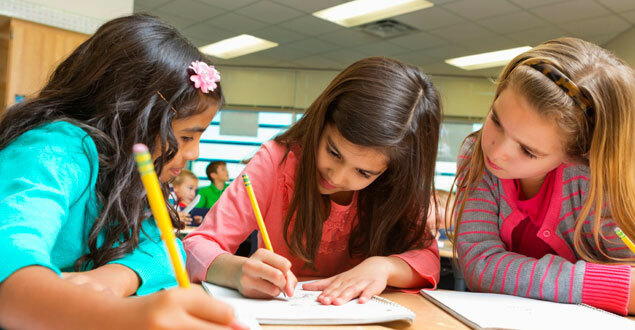 In this section, you'll find writing assessment resources, writing strategies, and additional tip sheets for teachers and parents on how to help third graders build strong writing skills. You'll also find video of children's authors, classroom instruction, and literacy experts. Select the "Sample" links at left to view real examples of third grade writing at different skill levels. Video developed by Great Schools and used with permission.